If you have a flexible time on journey and need driving adventure in Bali, Hiring Car with Self Drive is good alternative. 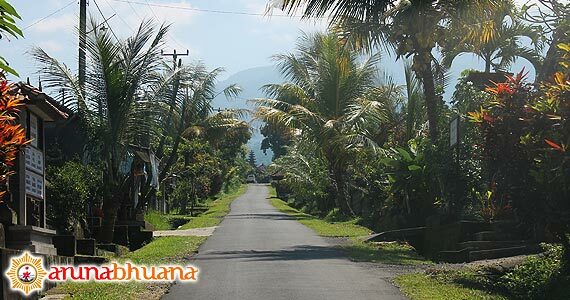 24-hours and free limitation mileage for your trip around Bali Island. Explore the natural beauty, culture and traditional life style of Balinese community with your own car. 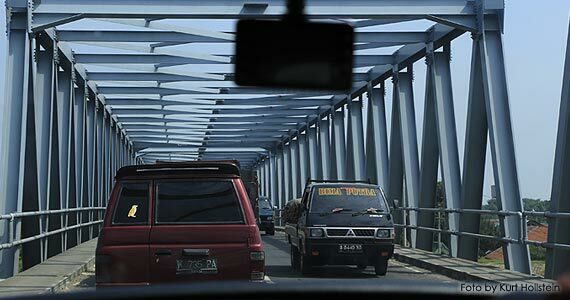 Here, some tips for safety when you drive in Bali by your own car. 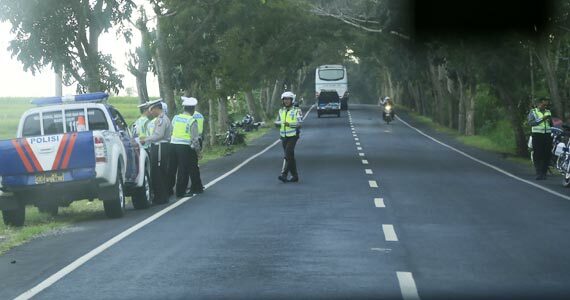 Of course, a valid International Driving License is required for foreigner if they would like to self driving in Bali. While on the road, an important virtue to have here is patience! Although the road system in the heavily populated areas is in reasonable condition compared to other developing countries, it can be heavily congested at peak periods. Ceremonial processions sometimes occupy the whole road so if you are caught behind a procession, enjoy the colorful experience. Roads can also be quite narrow with heavy pedestrian traffic on each side. In less populated areas, roads may not be tarred and the famous "gang" (small road is enough to accommodate one car, but very often two-way) is ever present no matter what area you may be in. This invariably tests the reversing skills of many drivers! 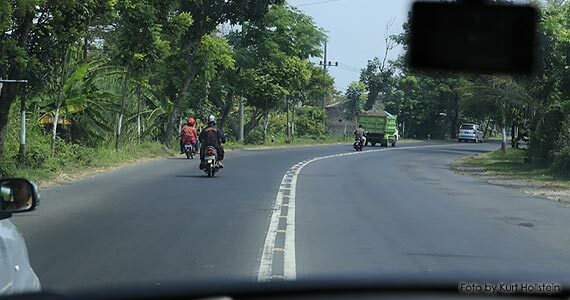 Take note of several important points while driving in Bali. It is not unusual for cars and bikes to swerve into your lane without indication. A system of "sharing lane" has developed because there are often obstacles on the sides of the road, such as parked cars or the frequent procession of bakso trolleys and paraphernalia salesman. That's okay if you're used to it but can be quite a shock to the new driver in Bali! Be aware that drivers from side streets often don't look when joining a main road and the larger vehicle is king of the road. Quite often red traffic lights are considered "only as a suggestion" and there are a few places where traffic in the left lane may turn or continue straight through whilst the light is red with a sign "belok kiri jalan terus". Remember to "toot" your horn when going around curves on mountainous roads as drivers commonly drive in the middle of the road here. There are many one way roads in Bali (mean to help traffic flow but it hasn't really turned out that way). If you miss your turn off, you may have drive quite a distance before being able to turn back. This has resulted in motorbike riders riding a few hundred meters in the wrong direction, as a shortcut rather than following traffic flow. Be alert! You can fill up the gasoline at any of the numerous governments owned petrol stations or in more remote areas as stalls by the side of the road displaying bottled of clear liquid. The quality may not be as good as at the petrol station. Please fill up your car hire at the government petrol station in the beginning of your daily adventure. It is not recommended to drive at night on the remote area as leafy tree branch often marks obstacles such as potholes or road construction. 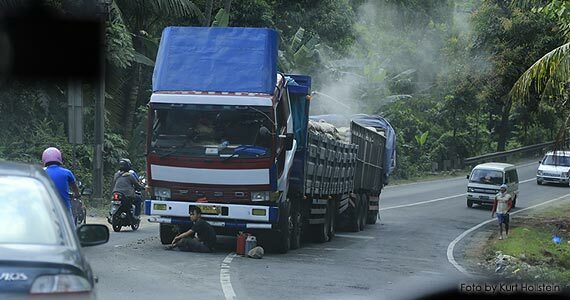 Truck/bus drivers also notorious for overtaking on corners when drive at night; especially they come from or to Java Island for taking Ferry for cross the Island.